What a beautiful weekend this turned out to be! Sunny and full of color, blue skies and fluffy soft clouds, just what a spring weekend should look like. One as crazy as me would of course, spend this beautiful weekend mostly cooking, and on Sunday I was happy to share the fruits of my cooking with good friends. 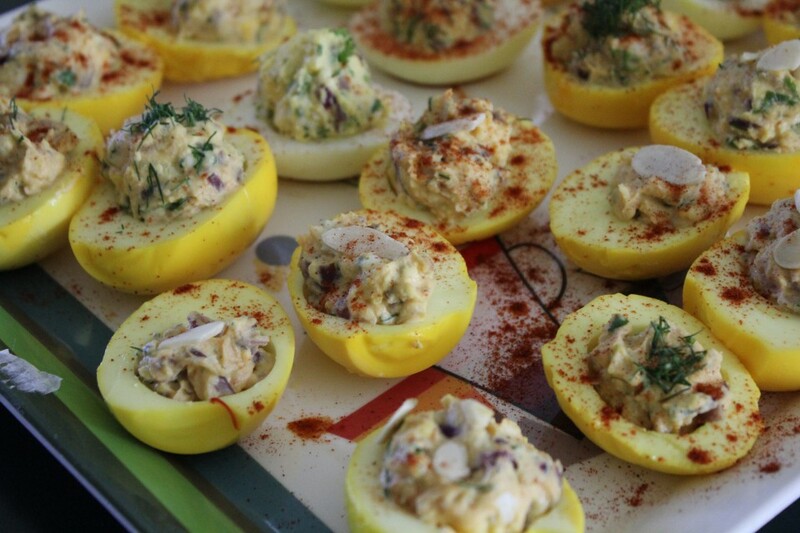 Among other things, I made deviled eggs, of course I made them my way. Full of color and just a touch of spice, and well the kind of dish that seems to disappear fairly quickly! Spring and eggs have a lot in common, as this is indeed the time of the year when a lot of fresh eggs are available in farms and farm markets. In fact, for the weekend I had picked up a bunch from here. If you are looking for ways to use up some of those excess Easter eggs, you can start with this dish that I had shared with you last year this time. And, of course there are these simple, fragrant and delightful deviled eggs that I made earlier today. 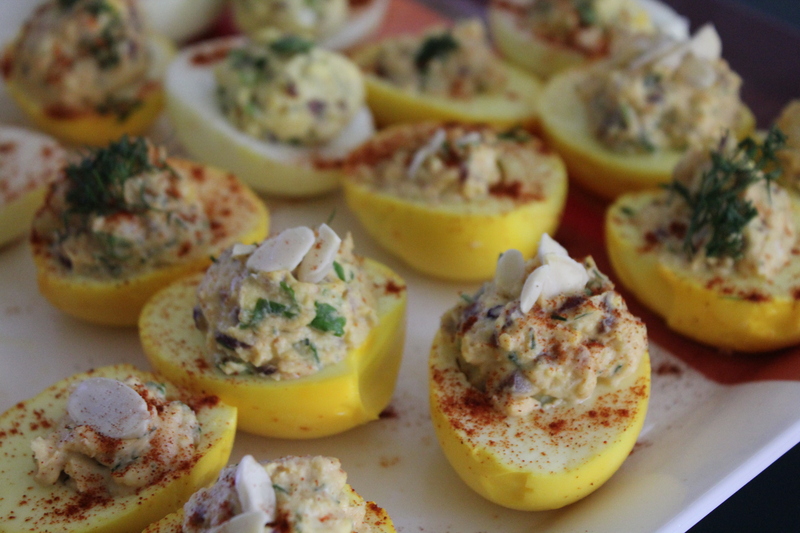 The highlight of these deviled eggs are surprisingly the saffron tinting which was a total experiment. The add a delicate color and exotic fragrance that takes these eggs to a very different level. Hard boil the eggs and carefully shell the eggs. In a large mix bowl place the eggs with enough water to cover the eggs and add in the saffron strands. Note, if you are in a hurry and are not interested in colored eggs you can skip this step. Let the eggs rest for at least 1 hour or longer. The saffron should dissolve and color the eggs a nice golden orange color. While these are soaking heat the oil and add the red onion and cook for about 5 minutes, add in the mirin or white wine and continue cooking until the onions are golden and soft. Remove the eggs, and carefully cut then into half and remove the egg yolk in a mixing bowl and place the egg white back into the saffron water (this streaks the upper cut halves). Mix the yolks with the onions, cumin, mayonnaise, mustard, minced dill, salt and sriracha and mash until nice and smooth. Remove the whites and fill with the prepared mixture and arrange on a plate. Garnish with the dill and the sliced almonds. Sprinkle with the paprika and enjoy.